The summer is the time to hit the brakes of our daily life. It’s the time to step back and relax. 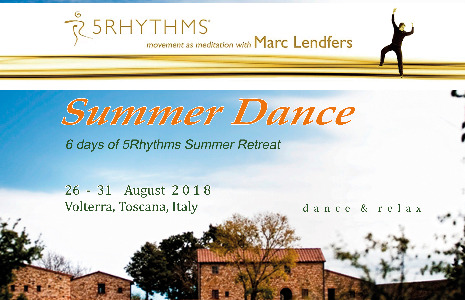 With the 5Rhythms as our guidance we dance into that natural state of relaxation where it's easy to be with oursleves,and everything which moves us, and with eachother. In the dance we move with the qualities of elements, earth, fire, water and air, how we can connect with them to support us in our daily life and to dive deeper into their healing presence. We will reconnect with our bodies in a profound and playfull way. Our bodies will be our entrance to move with our state of being and our emotions. The Summer Dance is a place to meet other dancers on a deeper level in a relaxed way. A lot of lifetime friendships have started here. Sunday: arriving in the afternoon, in the evening opening-circle and dancing. Monday: prgram in the morning and in the late afternoon/evening. Tuesday: program in the morning and in the late afternoon/evening. Wednesday: program in the morning, free time in the afternoon and evening. Thursday: program in the morning and in the late afternoon/evening. Friday: program in the morning and closing-circle at about 13.00. The venue is in the middle of nature where you can spend time under the trees enjoying the views, or have a swim in the natural pool, or treat your body in the hot water of the caldarium. The food is delicious and there will be some free time to visit San Gimignano (New York of the middle ages) or to Volterra (an old Etrusken village) or Berignone Natural Parc. We will dance at the amazing venue Mandala Tre Querce.